Save your window from streaks—and still save a little money—with a DIY version of your favorite commercial cleaners. Dirty windows or a streaky glass door are easy to notice and are easy to clean. Yet, cleaning windows and doors always seems like a chore we put off—even though it requires minimal work. No more excuses! You don’t need any fancy cleaners or tools when you can make the recipe for free from supplies in your house. Save some dollars and keep things simple by mixing up your own DIY window cleaner with nothing more than a few pantry staples you likely have on hand. This homemade cleaner is a solution of ingredients that you can actually pronounce—like vinegar and water—and can whip up quickly and leave under your sink for the next time it’s needed. Here’s the recipe for success. Raid your house to gather the materials. Here, as in so many other non-toxic cleaners, vinegar plays a key role. Its acidity cuts through dirt and grease, an attribute that well equips the window cleaner to remove streaks. If you’ve washed your windows for years with a commercial cleaner, it’s likely that the glass sports a subtle, waxy film. That comes off easily with ordinary dish detergent, another ingredient contributing to the efficacy of homemade window cleaner. Mix your ingredients. In a spray bottle, combine a 1/4 cup vinegar with a 1/2 teaspoon of liquid dish soap. Dilute the solution with two cups of water, then shake the bottle vigorously to mix the components. If you happen not to have vinegar on hand, note that you can substitute in lemon juice. Like vinegar, lemon juice has a mild acidity that cuts through grease and grime with equal panache. As a cleaning agent, there’s much to love about vinegar, but the strong odor isn’t everyone’s favorite thing. Fortunately, you can go a long way toward camouflaging the scent by adding essential oil into the spray bottle mixture. Pick your favorite oil—it doesn’t matter which—and include about 10 or 15 drops. 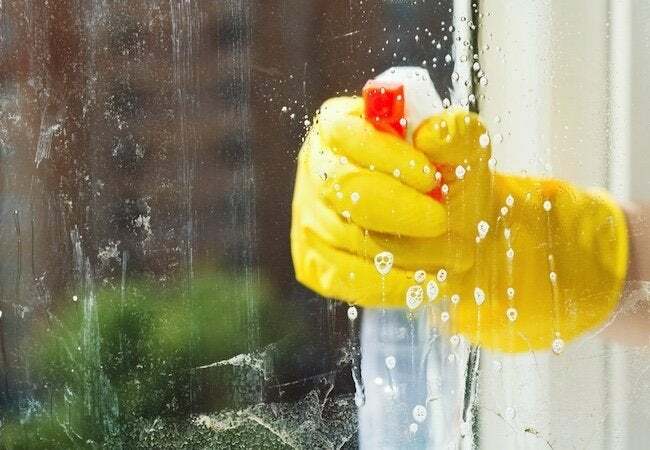 With your homemade window cleaner now ready, spray the window glass with it and then, using a lint-free cloth, wipe the cleaner across the entire surface you’re cleaning. Be careful not to use a cloth or sponge that’s going to leave streaks (or even scratches). For best results, opt for a microfiber cloth or chamois. 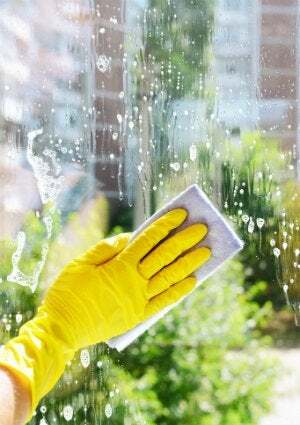 If the windows are dusty but not streaky, you can clean them without bringing a cleaning solution, homemade or otherwise, into the equation. Simply use a lint-free cloth to pick up and clear away the dust. Then, once finished, complete the job by polishing the glass to a shine with a different, clean cloth. If possible, clean your windows on a cloudy day. When sun is shining directly on the window, the cleaning solution dries faster leaving behind streaks or water marks.